One of the primary duties of a mutual fund manager is to notify investors about fund performance regularly. They manage this by sending a Consolidated Account Statement to investors regularly. In this article, we will explore the importance of consolidated account statements. What is a Consolidated Account Statement? Why CAS is important for mutual fund investors? How to generate a Consolidated Account Statement? How do AMCs compute Consolidated Account Statement? What are the contents of a Consolidated Account Statement? What is the disadvantage of Consolidated Account Statement? 1. What is a Consolidated Account Statement (CAS)? Consolidated Account Statement gives an investor all the details of his mutual fund transactions in an orderly manner at a single place. It shows the mutual fund investments so far under a single PAN. You can request for hard copy as well as soft copy of CAS once a month for free. It is an important document for investors as it carries every information regarding sales, purchases and other transactions in a mutual fund. This gives a proper insight to the investors about how to track mutual fund performance. 2. Why CAS is important for mutual fund investors? Consolidated Account Statement allows investors to understand the financial condition of the company. You can decide to choose a fund house or company, based on the info on CAS. It tells you a lot about the company’s ethics and standing, which is helpful for both investors and vendors. The paperwork also becomes minimal as one report contains the whole accumulated data or say all financial data at one place. It simplifies the overall process by cutting down all the subsidiaries and it can show the overall performance of the company. 3. How to generate a Consolidated Account Statement? Click on CAS- CAMS, Karvy, FT, SBFS. Key in your email id and your Permanent Account Number (PAN). Enter a password of your choice. 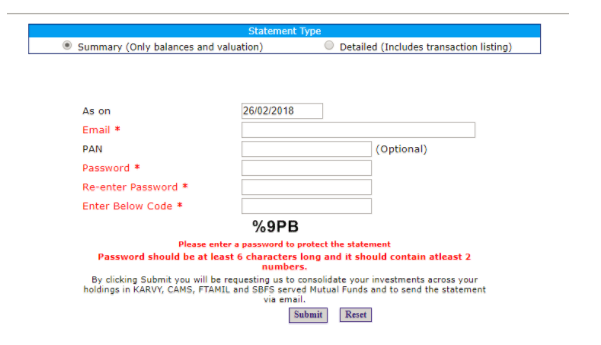 This need not be the password that you have given to mutual fund. Note: By using this, one will get a mail from camsonline. They will generate a password-protected pdf file. You must enter the password when you try to open the statement. Moreover, this facility is free of cost for all. 4. How do AMCs compute Consolidated Account Statement? The CAS computes the statement of transactions and holdings of investors demat account held with NSDL and CDSL. The NSDL CAS provides details of transactions and holdings across various Demat accounts as well as Mutual Funds. It also includes Equities, Preference Shares, Warrants and Mutual Fund units held in Demat form. Money Market Instruments, Securitized Instruments, Government Securities and Corporate Bonds form the rest. There are certain platforms like Karvy, Cams, FTAMIL, and SBFS that allow an investor to access consolidated view of his holdings/funds under a single PAN. The investors will receive it via email. 5. What are the contents of a Consolidated Account Statement? A CAS includes all financial purchases and transactions like switching or merging of funds, dividend or bonus payments, bank account details and redemption before or after maturity periods. They also contain information regarding reinvestment or if it is a New Fund Offer. It specifies the investment method-whether lump sum or a SIP ( Systematic Investment Plan ) along with closing and opening share unit portfolio balance. Some investors opt for Systematic Withdrawal Plan or Systematic Transfer Plan too, which the AMC mentions in the statement. Apart from the name and contact details, CAS entails nominee registration and contact information of your bank. It also contains other information like the mode of holding units, ISIN and UCC for every plan and portfolio. CAS makes it easier to check the KYC Status and nominee registration status. However, it will not have confidential information like PAN Number and bank account number. 6. What is the disadvantage of Consolidated Account Statement? A consolidated account statement combines information like companies’ assets, liabilities, and income. When an AMC consolidates every information pertaining to a fund, it can also hide the profit or loss. This could be because it shadows the inter-branch transactions and shows only the consolidated financial statement.